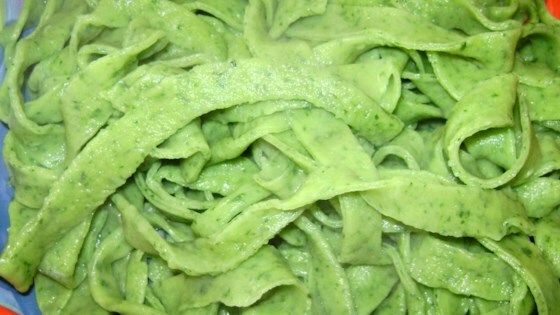 "These green spinach noodles have a very interesting texture and flavor--but they taste better than store-bought noodles because they're fresh. Use in soups, or serve alone; they are great either way. This is an easy recipe, and you'll get lots of compliments because you made them yourself." Combine spinach and water in a saucepan. Cover, and cook till spinach is very tender. Cool slightly. Place spinach and liquid in blender container. Add egg and salt. Cover, and blend till smooth. Transfer to a bowl. Add enough flour to make a stiff dough. Turn dough out onto a lightly floured surface. Knead for 1 minute. Roll very thin on a floured surface. Let rest 20 minutes. Roll up loosely. Slice 1/4 inch wide. Unroll. Cut into desired lengths. Spread out on a rack to dry for 2 hours. It doesn't get fresher than this. Chef John shows us how it's done. Squeeze all the water out, and chop the cooked spinach as finely as possible. Add beaten eggs for the moisture component - this will make a much better noodle. Tasty noodles don't really taste like spinach so my kids liked them too!